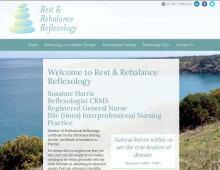 Susanne Harris is a qualified CRM5 Reflexologist in Haslemere, Surrey offering clinical reflexology as an holistic therapy treatment. Susanne is also a Registered General Nurse and has a BSc (Hons) Interprofessional Nursing Practice degree. Clinical reflexology treatments offered by Rest and Rebalance Reflexology include palliative care reflexology, and pregnancy & maternity reflexology. Susanne is an experienced reflexology practitioner treating ailments such as allergies, anxiety, depression, painful joints and injuries. Contact Rest and Rebalance Reflexology to arrange an initial consultation for reflexology in Farnham, Haslemere & surrounding areas of Hampshire, West Sussex & Surrey.